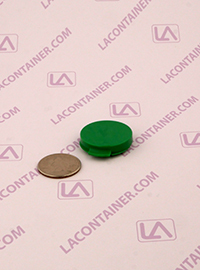 The Lacons® 120300 is the perfect plastic container for your cosmetic samples. 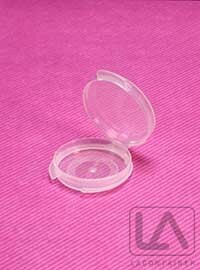 This 1/20oz plastic container is made from a medical grade polypropylene plastic that is FDA compliant and BPA free making it a safe and reliable choice for your lotions or other beauty samples. 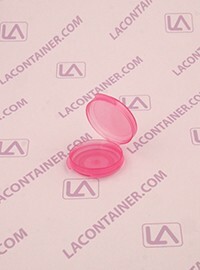 Thanks to the air and moisture resistant hinged lid design, these thin 1/20oz containers are sure to keep your cosmetic skin care samples safe and secure inside the container. 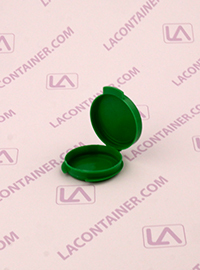 These Green containers come in a convenient 100 piece bag, the perfect amount for making samples of your cosmetics. 1.06" Dia. X 0.21" Ht. 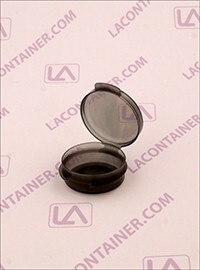 30.23mm Dia. X 7.37mm Ht. 26.92mm Dia. X 5.33mm Ht.